Our Defensive Driving Course & Insurance Reduction Program Will Save you Money and Make You a Better Driver. EZ Wheels Driving School is offering a Defensive Driving Course & NJ Insurance Reduction Program class this Saturday, July 23rd at our Morris County driving school office 10 West Blackwell St. Dover NJ 07801 973 749 1600. By taking a defensive driving course you will become a better driver. Once you complete our course you can then get a reduction in you auto insurance rate. 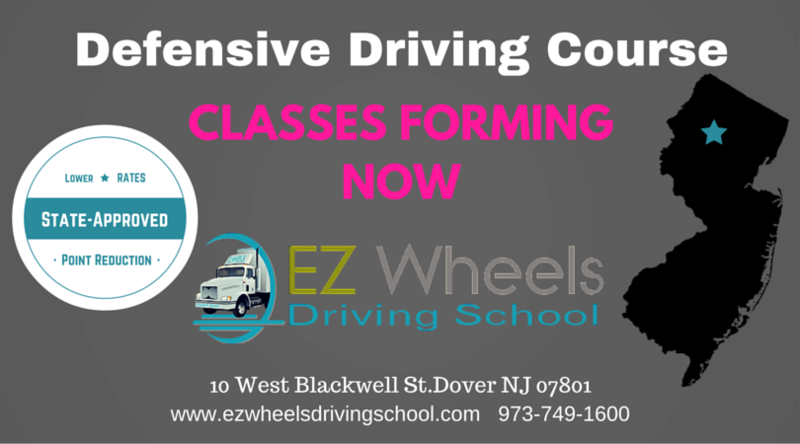 EZ Wheels Driving Schools in New Jersey offers defensive driving courses and driving lessons to new and existing drivers. With our defensive driving course you will learn how to keep points off your driving record by obeying all traffic laws, avoiding mistakes that put other drivers at risk, and most importantly driving defensively.Traffic violations can be expensive and any points received from the violation can stay on your record for two years. Remove the points from your driving record by completing a defensive driving course at EZ Wheels Driving Schools.Upon completion of the defensive driving course, two-point you currently have on your license will be removed and you may also qualify for lower insurance rate.With our five locations in Union City, Passaic, Woodbridge, Elizabeth, and Dover it has never been so easy to register for a defensive driving course in New Jersey.In-person Defensive Driving courses offered from Wheels are guaranteed to be accepted by insurance companies. Online classes, on the other hand, are often rejected and not considered sufficient. Save time and money by registering with EZ Wheels Defensive Driving course today!